One of the hardest aspects of fatherhood is getting your kids to eat healthy. Kids typically want to eat everything that's bad for them, but you need to make sure they're consuming nutritious foods too. You don't want to look like the bad guy, so here are some helpful tips to get your children on the right track to being healthy. The trap of takeout is slippery and dangerous. The convenience of professionally prepared food is so appealing, especially when you're trying to feed a whole family. Rather than spend too much money on unhealthy food, instead plan your own balanced dinners that hit all the major nutritional food groups. Rice or pasta can cover the grains, chicken can be your protein and vegetables such as tomatoes can provide adequate antioxidants. It may be a bit of a nightmare in terms of prep and clean up, but letting your kids help in the kitchen can get them interested in their own nutrition. You can teach them the different steps it takes to get ingredients ready to be cooked. You can give them their own station so they can work by themselves under your supervision. 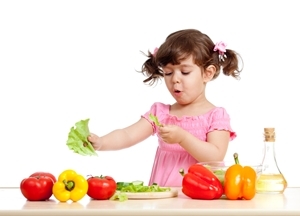 Eating healthy is one of the best methods to avoid the possibility of childhood obesity. Taking part in nutritious meals is a great way to get everyone involved in being fit and healthy.